Steel roof panels are a major step up from traditional shingles, paying their way off over time and adding a unique appearance to your residential home or commercial building. 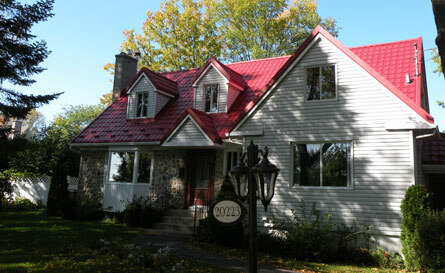 As a roofing contractor in Montreal, we have had the pleasure of servicing hundreds of customers over the years. These steel roof panels are light-weight, a little more expensive than the traditional products of a lesser quality, and gets you longevity from your roof in a way that you might not have experienced in the past. With a steel roof installation in Montreal, you get a product that is very low maintenance, weather and wind resistant, of a superior strength and durability, and no longer will you have to worry about cracking or seasonal damage. It's important to select an experienced steel roofing contractor in Montreal to ensure that attention to detail is paid from the initial planning stages through to completion. Our company offers the highest quality metal and steel roofing solutions in the greater Montreal region and throughout Ontario. We advise anyone looking for a roofing contractor in Montreal to visit our showroom where you can view our products in-person and speak to a member of our staff who would be happy to assist with any questions you may have.